Finding the right make-up artist is equally as important as finding your perfect wedding dress, your wedding day image will be captured in photos forever, so you want to look your best. It’s important to find a make-up artist that makes you feel comfortable and relaxed. Finding your best feature is the key to being a natural beauty, your make-up artist should hold both the experience and intuition to help you find and accentuate your best assets. Have you got delicious Angelina Jolie lips? Huge almond Ann Hathaway eyes? All of these vital features could be lost by bad make up application. 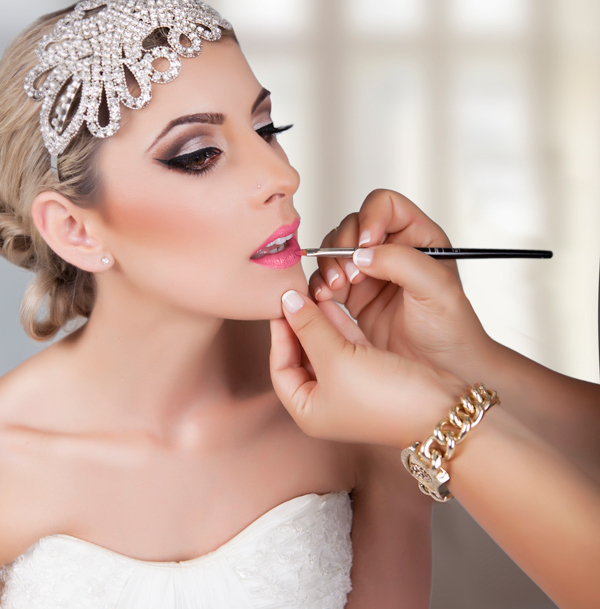 With a wealth of experience in the beauty industry including advertising, TV and fashion, Debbie Delgado understands the unique requirements of bridal make-up and the value of having long lasting and flawless make-up that looks spectacular for hours, both in person and in photographs that last a life time. Theres also a travel fee os $100 per hour driven. Contact Debbie today for more information on her bridal make up service. * To save the date a deposit is required (amount will depend on the location and amount of people). Date changes will depend on availability and must be done at least 3 months before the event. Deposits are non refundable.